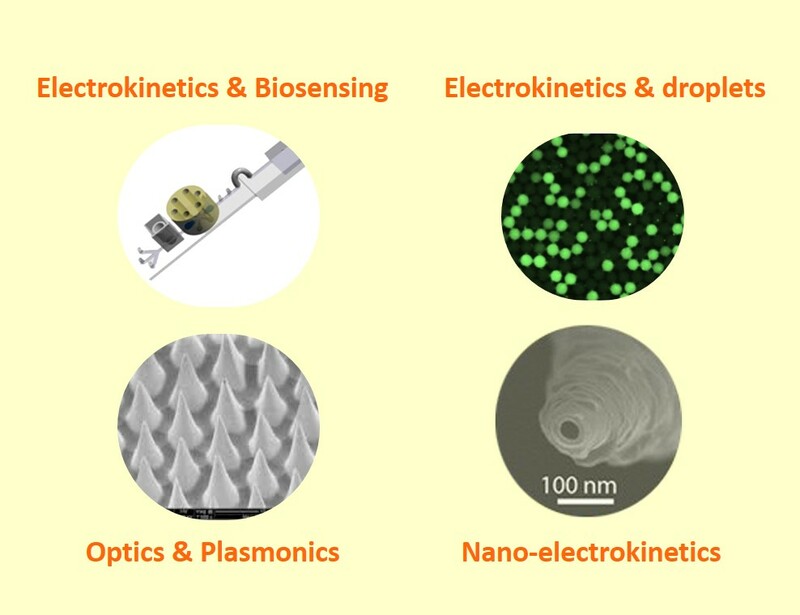 Our lab focuses on microfluidic and nanofluidic research coupled with electrokinetics, optics, plasmonics and acoustics for biosening applications. We are able to fabricate nanofluidic transistor circuits that exhibit oscillatory, excitatory, inhibitory and hysteretic ion current/voltage features, including memristor logic circuits that allow digital (binary) address of large ionic circuit sensor arrays. We have also developed integrated biodetection platforms that can 1) manipulate biological samples by lysing cells/exosomes and extracting biomarkers, 2) concentrate the biomolecules and 3) detect the biological signatures with high specificity and sensitivity. A particularly exciting new direction is the integration of electrokinetics with low-cost plasmonic circuits, including plasmonic rectifiers and amplifiers, and Up-Conversion nonlinear nanoparticle reporters with singular and narrow bandwidth spectral modes for FRET, Raman and fluorescence molecular sensing. Resonant charge/current integration of these plasmonic, electrokinetics and nonlinear optics components promise to launch the next generation of large-library nanoarrays with single-molecule sensitivity. We are currently pursuing biosensing of pathogens associated with infectious diseases, cancer detection, waterborne diseases, foodborne diseases and environmental applications.